We had to get two tires recently, after the Civic got a flat. Naturally, we wanted the new tires on the front. That's where steering and braking happens, as well as the drive wheels and most of the car's weight ... so that's where we wanted the newer tires. The shop (America's Tire) refused. They said it's a company policy that a new pair of tires must always go on the rear. They've even printed up glossy signs explaining their reasoning -- a fancy poster image that is, unfortunately, wrong. They show two scenarios. In the one on the left, the rear tires are losing traction, and the rear end of the car is sliding out. That's called "oversteer". The car might spin, especially if the driver has never experienced it before. That part's all true. 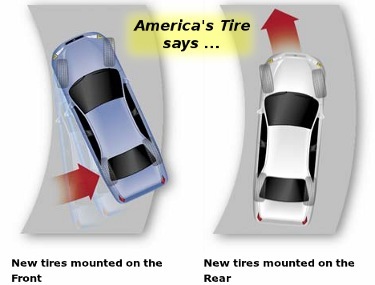 The problem with their diagram is the scenario on the right, where the presumably better tires are on the rear. 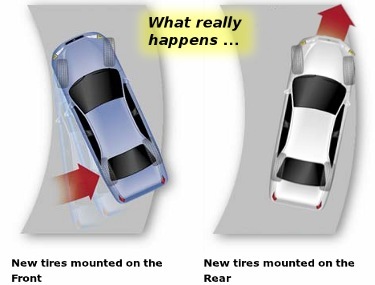 In their diagram, magically all four tires are holding -- nothing ever loses traction. Good deal! But what really happens if you put the bad tires on the front is that if something slips, it'll be the front. That's called "understeer". Understeer can be just as dangerous as oversteer. With practice (I recommend autocross!) a driver can learn to detect oversteer and steer out of it before it gets to be a problem. There's an old saying among racers and performance drivers: "Oversteer is when the passenger is scared. Understeer is when the driver is scared." Most passenger cars, especially front-wheel-drive cars like our Civic, are designed to understeer severely to begin with. Putting the poorer tires on the front makes that even worse. And don't forget the importance of braking. Most of a car's braking ability comes from the front tires. Don't you want your best rubber working for you in a panic stop? While I do understand why the default might be to put new tires on the rear -- it's better for inexperienced or panicky drivers -- to insist on it in all cases is just silly. We drove the Civic home and rotated the tires ourselves. How did the policy get started? Dave and I first encountered this policy a couple of years ago. In the intervening years, it's become pervasive -- just about every tire shop insists on it now. How did that happen? If you ask at the tire shop, they may tell you that it's a federal policy -- DOT or some such agency -- or even that it's a state law. Neither is true. It's merely company policy. Some will also tell you that it arose from a lawsuit in which a tire company was sued after a customer spun out. So two years ago, we went looking to see if that was really true. Back then, googling either "oversteer" or "understeer" led inexorably to a Wikipedia page with a reference to "San Luis Obispo County Court Case CV078853". Unfortunately, Wikipedia's link next to the court case reference actually led to a general page for a law firm that appears to specialize in vehicular personal injury lawsuits. (Nice advertising, that.) There was no information about any such case. Nor did there seem to be any official records online of such a case; and the SLO courthouse didn't respond to an email request for more information. Googling the court case, though, got lots of hits -- nearly all of them pasted verbatim from the Wikipedia page, then using that as "proof" of the supposed safety argument. The news is better on the Wikipedia end. Someone eventually heeded Dave's attempt to fix the Wikipedia page, removed the bogus advertising link to the ambulance-chasing law firm, and added "citation needed". Subsequently, several people rewrote the page in stages, with comments like "This is a complete replacement. The existing version was wrong from the 1st sentence and has little relationship to the standard terminology." The page is much better now. What isn't better is that the sentence from the old Wikipedia page is still all over the net, word for word. Google for the court case and you'll find lots of examples. Many of them are content mills copying random Wikipedia content onto pages that bear no relation to cars at all. But unfortunately, you'll also find lots of cases of people using this phantom court case to argue the safety point. Sadly, it seems that once something gets onto Wikipedia, it becomes part of the zeitgeist forever ... and however wrong it might be, you'll never be able to convince people of that.